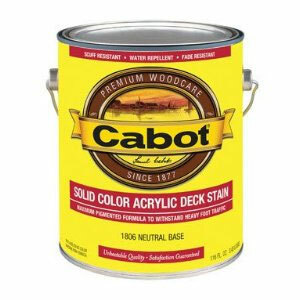 Cabot® Solid Color Decking Stains are extremely durable exterior stains for use on all wood decking, outdoor furniture and fencing, as well as cement patios and walkways. Solid Color Stains provide excellent adhesion to new, previously stained or painted surfaces, which are in a clean, sound condition. Approximately 150-250 square feet per gallon. Solid Color Decking Stains are ideal for use on most types of lumber including redwood, cypress, pine and fir, as well as pressure-treated wood.